The passing of Mickey Rooney the other day took me back to the 1970s, when he was frontman for one of the most creative ad campaigns ever launched in the beer industry. Forget the beer for just a moment. 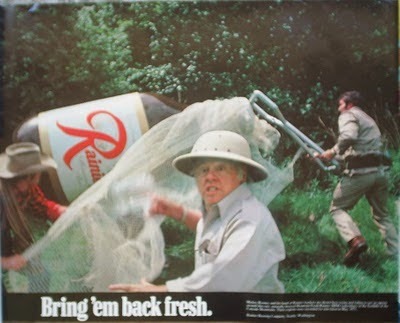 As a high school and college student, the ads made me want to like Rainier. But I couldn't manage it. You recall the ads, of course. In several, Rooney is the leader of a team of hunters chasing Mountain Fresh Rainiers in vaguely mountainous Northwest settings. The group comes close, but never quite manages to corral or "pop the top" of a wild Rainier. Probably just as well. The Rooney ads were part of Rainier's campaign to bolster its brand. For many years, Rainier ads graced TV, print and radio. They featured goofy, but highly memorable characters and themes. There was the running of the Rainiers. a parody of the running of the bulls in Spain. Long before Budweiser used talking frogs, Rainier used them to croak, "Rain-Neer, Rain-Neer." And who can forget the motorcycle that revs "Raaaaaiiiiinnnnn-neeeeeeeeerr-beeeeeeeeeeer," as it passes? Rainier spent a lot of money on these ad campaigns. Inquiring minds may wonder why. It's pretty simple. All the regional brands, which in the Northwest included Rainier, Olympia, Lucky Lager and Blitz-Weinhard, were under siege by the national brands by 1960s. It was sink or swim by the early 1970s. Rainier was trying to swim. You may wonder what could have happened to put the regional brands in such peril. For those who still read and want to know more, I suggest The U.S. Brewing Industry: Data and Economic Analysis, by Victor and Carol Tremblay. You may find it in your local library...or you can buy it on Amazon for a few bucks. The basic facts are these: In the aftermath of Prohibition and World War II, the national brands, represented by Miller, Budweiser, Schiltz, Pabst, had gained significant advantages in production, distribution and brand recognition. Those advantages provided cash flows that enabled them to spend freely on advertising, particularly TV advertising. Television, you may recall, was entering its golden age about this time. A wacky fact I ran across last year: In 1952, the big four national brewers accounted for 84 percent of network advertising revenue. That's a shocking stat, no matter how you cut it. By the early 1970s, the regional brands were on the run, faced with dramatically declining market share. They fought back by launching regional ad campaigns, of which Rainier's was arguably the most creative. Across the board, these campaigns bought the regionals some time. Not much more. Portland oldtimers will recall that Blitz-Weinhard took a slightly different tact. Its launch of Henry Weinhard's Private Reserve in 1976, combined with a folksy ad campaign, was an effort to maintain market share in the face of onrushing national brands. One might argue, as I have argued, that Private Reserve was a precursor to the coming craft revolution. Despite the efforts of the Madmen who created the ads that featured Mickey Rooney and others, it all went bad for Rainier. The company, which started brewing in Seattle in 1878, operated in California when state prohibition came in 1916, then returned in 1935, was sold to G. Heileman Brewing Company in 1977. It changed hands a few more times before landing with Pabst, which closed the brewery in 1999. Blitz-Weinhard suffered a similar fate, if you're keeping track. You can still find Rainier. It's produced in a factory brewery outside Los Angeles. The creative, funny ads featuring Rooney and others, like similar ads fielded by many regional brands in the 1970s, served mostly as a sort of bridge to a period dominated by consolidation and mega brands. Today, craft brewers are moving us the other way, toward a return to mostly local and regional beer. Better times. That madman was Gordon Bowker, who went on to co-found Redhook.